Here is a ventral abdominal wall defect. 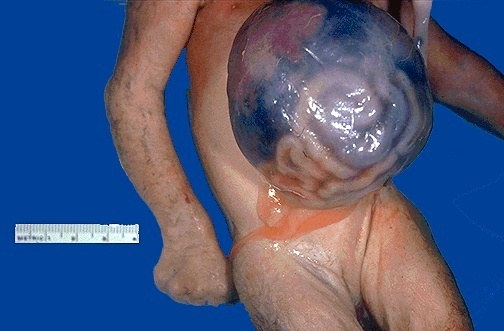 This defect involves the region of the umbilical cord, so this is an omphalocele. Note that there is a thin membrane covering the herniated abdominal contents (loops of bowel can be seen under the membrane). This defect would have to be repaired over a period of time. Since the bowel has mainly developed outside of the abdominal cavity, it is malrotated and the cavity is not properly formed (too small).